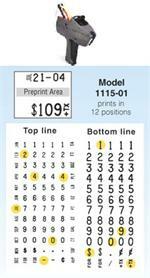 Retailerlabels.com is the single most comprehensive website for your everyday labeling and price marking requirements. 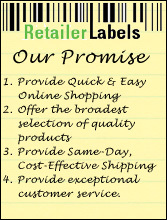 At Retailerlabels.com, you will find all of your retail labeling, tagging and price marking needs "under one roof". We carry the most popular label guns and price labels, barcode labels, tagging guns and tagging supplies, Monarch Avery Dennison products, ink ribbons,TOWA / Hallmark Pricing Guns, clothing labels and sizing strips. Our label inventory includes BOGOF Labels(Buy One Get One Free), Best By Labels, Bakery Labels, Barcode Labels, Clearance Labels, Cosmetic Labels, Dairy Labels, Deli Labels, Discount Labels, PLU FDA Approved Labels, Floral Labels, Fluorescent Labels, Frozen Labels, Grocery Labels, Meat Labels, Plain White Labels, Organic Labels, Produce Labels, Reg Price/Our Price Labels, Removable Labels, Sale Price Labels, Seafood Labels, Security Labels, Serrated Labels, Sell By Labels, Specials Labels, Tags & Fasteners, Use By Labels, and many others. Custom Labels are also available: Just call us toll free at 800-915-2196.